Welcome to the official website of The KLOCKS. for bookings contact us @ 210 573-5738 or click on the booking link on any page of this website. We are a four piece TOP-40 Dance Variety Rock n Roll band from San Antonio, Texas. We play Weddings, Conventions, Corporate Events, Clubs, etc. specializing in TOP-40 Cover songs. From today's current hits all the way thru to the '70's, plus Rap, Country, Latin and more, we perform what you want to hear. Add a killer Lighting Display, state-of-the-art P.A. 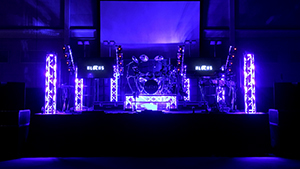 System and Video to put it over the top and you have the perfect atmosphere for an amazing event. 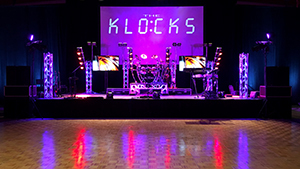 Having been together now for over 21 years as a band and a successful business, The KLOCKS can pretty much do it all. We hope you enjoy our website! Come out and see us play for your next great time! It's always sad when one of us moves on & takes another path in life, but it's also exciting. For our boy Steven, his parting words sum it all up nicely in his article entitled "PASSING THE TORCH"
Check out the latest news article penned by Ed Doran. It is called "THINGS YOU MAY NOT KNOW ABOUT THE KLOCKS". Enjoy!